The race starts at 9:00 am with the transition area open at 7:30 and close at 8:30. Can I wear a wet suit? Of course! This is not a USAT event! Is this a USAT Event? Yes, a free t-shirt is included for anyone who registers before June 23rd. Where can i find the most up to date information and ask questions regarding the BLT? We use Facebook to keep the information up to date. Please like us on Facebook. Will there be assigned racks in the transition area? Yes, each rack will be labeled with eight racers numbers i.e. 1-8. You MUST use your designated rack. Your specific location on your rack is determined by a first come first serve basis. What is the full distance of the Bostwick Lake Triathlon? We have done our best to provide courses that are as close to those in a sprint distance triathlon as the venue will allow for. This is not a certified course and many distances may not be exact. Where should I park for the event? Parking will be located just West of the Bostwick Lake Inn, near Stavros Restaurant. Additional parking will be on the streets and in the grass across from BLI. Are the courses the same as in previous years? Please be sure to check out the link in the above toolbar for up-to-date information. The run course is slightly different as there is now a running path on the back side of the lake. The run course will be marked with red arrows and orange paint. The Bike Course will exit the transition area and turn right. Where is the Start/finish/transition area located? All of the festivities are located in front of the Bostwick Lake Inn. The start will be near the deck, and the Finish will be on the bike path on Belding Road. When can I pick up my race information? Packet pickup will start at 7:00. You will pick up your runner number, bike number, timing chip and strap, at registration. Body Marking is not required and will not be provided. Do I need to wear my number? Yes, your bike must have the number affixed and you must wear your runner number during the run. Should I bring my own swim cap? Yes, we do not provide swim caps. Where should I put my timing chip? Your timing chip must be on your Left ankle with the chip facing outwards. Do not lose your chip as there will be a charge for lost chips. Where can I find results? Check out the results tab above for the latest results. All age groups will be posted online. Where do we exit the water? You will exit the water at the BLIA boat launch just North of Bostwick Lake Inn. The launch will be closed for the entire event. Is the course closed to traffic? No, please remember that the courses are not closed to traffic and you should always proceed with caution at any intersection. The Rules of the Road apply to this event! Seriously? Of course not! This is a race against the clock and any use of another racer, biker, or vehicle is not permitted. Penalties may be applied at the discretion of the race director. How will the courses be marked? The swim course markers will be identified prior to the start of the swim. The bike course will be marked with white paint leading up to major intersections. 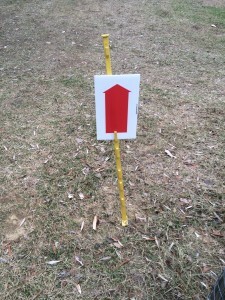 The Run course will be marked with arrow signs and street chalk leading up to the corners. Please remember that in many locations of the run course you will be on private property. Be respectful as we want this great event to continue in the future.